Shazam, the app that helps you find out what that song is that’s playing and driving you crazy because you can’t figure out the band, has predicted which tunes we’ll be listening to this summer. According to the company, the top 10 list of this summer’s potential hits was compiled based on songs that are currently being tagged as well as new singles that the Shazam tag chart indicates will be big hits. 1. Daft Punk’s “Get Lucky” is probably the most hyped track this season. The fact that it has received four million tags and has been No. 1 on the Shazam Charts in 91 countries shows that it’s living up to expectations. 2. Like Gotye last year, Passenger’s “Let Her Go” picked up traction in Australia at the start of the year before hitting No. 1 in 13 international Shazam charts. With 3.8 million tags already, expect it to go stratospheric when it breaks in America. 3. 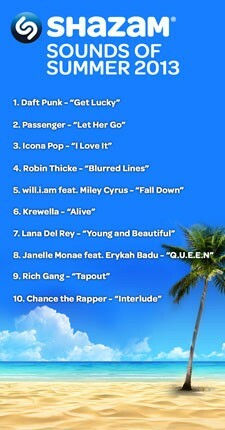 Since being used in the TV show, Girls, Icona Pop’s “I Love It” has been a permanent fixture in the Shazam charts. Its daily interactions are still building, so don’t expect this track to disappear anytime soon! 4. Robin Thicke’s “Blurred Lines” seems to be on a steep upward trajectory. It has already garnered 4.2 million tags but hasn’t yet reached its peak. 5. will.i.am’s previous singles “Scream and Shout” and “#thatPower” were huge with Shazam. His new track “Fall Down” with Miley Cyrus already seems to be going down well with Shazamers. 6. Krewella’s euphoric single “Alive” has been a mainstay of the dance-focused Shazam Beatport chart. With tags climbing worldwide, this looks like it could be a contender for the summer club anthem. 7. From the soundtrack to The Great Gatsby, Lana Del Rey’s “Young and Beautiful” is already showing traction on the Shazam charts. 8. Janelle Monae’s new album should be one of the summer’s most popular. The first single with Erykah Badu, “Q.U.E.E.N” is already receiving a lot of tags. 9. Shazam regional tags show that Rich Gang’s “Tapout” has been trending well in the Southern U.S.
10. Chance the Rapper’s “Interlude” is the most Shazam’d song from one of the most critically acclaimed mixtapes of the summer.